Sausage of any kind -- cooked, raw, in casings or in bulk -- can be refrozen after being thawed -- as long as you follow some rules. Freezing doesn't destroy bacteria and ground meat products, like sausage, are more easily contaminated than whole cuts of meat. For this reason, you should be extra careful whenever you cook with sausages. When you follow safe food handling practices, you can safely refreeze those sausages for later use. You can refreeze sausage, if you handle it safely. First, buy sausage at the end of your shopping trip so it stays cold longer. Refrigerate it as soon as you get home at 40 degrees Fahrenheit and freeze it within two days. Thaw sausage overnight in the refrigerator, never at room temperature, which promotes bacterial growth. Pork and beef sausage should be cooked to a minimum temperature of 160 F. Cook sausage containing poultry to 165 F. Once cooked, the sausage should be cooled quickly and frozen or refrigerated within two hours. Following these steps cuts the risk of foodborne pathogens contaminating the sausage, making it safe to refreeze. To refreeze previously frozen raw or cooked sausage, pack it loosely into airtight freezer boxes or plastic bags. Squeeze out as much of the air as you can and seal it tightly. Label the packages with the date and pack them in a freezer set at 0 F or colder. Food stays safe indefinitely in the freezer, but that doesn't mean it will taste good after years in the freezer. 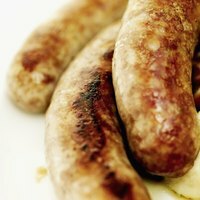 Sausage and other ground meats tend to lose quality faster than larger cuts of frozen meat, especially if they've been frozen and thawed already. The process of freezing, thawing and refreezing causes moisture loss, and may make the meat more prone to freezer burn or an unpleasant taste. Your best bet is to use the sausages within one month. After that, the meat might not taste as fresh as it should. When it's time to use refrozen sausage, thaw it in the refrigerator overnight. Heat it in a skillet, slow cooker or baking dish to 160 F. Sausage that's been thawed several times tastes best when combined with other ingredients in a savory casserole, soup or pasta dish. The moisture in sauces and broths will help alleviate any dryness and flavorful ingredients mask the "frozen" taste.